The National Instruments PXI-4070 FlexDMM achieves remarkable throughput rates while maintaining precision and stable measurement accuracy. This combination of speed and accuracy was previously available only with higher-resolution digital multimeters (DMMs) costing thousands of more dollars. Thanks to the National Instruments proprietary FlexDMM technology, this DMM also provides a fully isolated, high-voltage digitizer capable of acquiring waveforms at sampling rates up to 1.8 MS/s at ±300 V input. Using the analysis functions in National Instruments LabVIEW software, you can analyze these waveforms in both the time and frequency domains. Because of its superior speed, accuracy, and functionality, the NI PXI-4070 is ideal for use in automated tests on both the production floor and in R&D environments. You also can use the PXI-4070 with PXI switches to form a multichannel, high-voltage data acquisition system. The NI PXI-2527 64-channel, 300 V multiplexer offers a low-thermal emf solution for both high and low-voltage measurements. The NI PXI-2530 128-channel reed relay multiplexer offers more density for higher-channel-count systems and better performance for low-current switching. For additional switch configurations, visit the PXI Switches link in the Resources section. 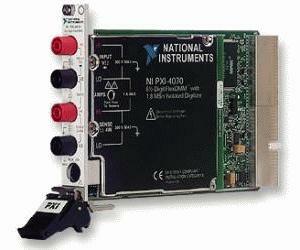 The National Instruments PXI-4022 accessory module consists of a high-speed, high-precision amplifier that conditions signals for acquisition. With the guarding functionality, you can make 6-wire resistance measurements for resistors connected in parallel on complex printed circuit board layouts or cable test applications. For low-current measurements, the NI PXI-4022 amplifier and high-precision resistors create a feedback current amplifier. This implementation minimizes burden voltages and converts current to voltage, so you can measure picoampere signals with femtoampere noise.